I know I always say this.. but can you believe how fast the year is going. Summer is over, we just had Labor Day and the kids are back in school. So how did the last month of summer 2016 real estate market fair in Portola Hills? As with most of South Orange County the real estate market, quieted down a bit. Which is typical this time of year. Though for my business I felt as if open house traffic was up. It is not that buyers are not there.. they just were distracted with the summer events. Below is a look at home values for Portola Hills in August. With summer distractions come longer days on the market. The average days to sell a home in Portola Hills in August was 49 days. As we enter Fall we should continue to see home values balance out. In July we saw a 20% increase in home prices from 2015... In August the mix that was sold gave us a 3% increase from August 2015. In order for home sellers to receive top dollar in today's market it is critical homes are priced right, presented well and available. It is like baking a cake if one ingredient is missing then the cake just does not taste good. 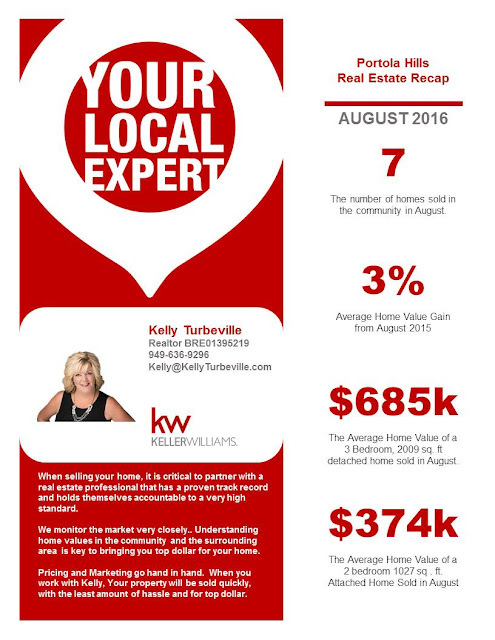 If you would like to review the market and discuss a strategy to buy and or sell your Portola Hills home, please do not hesitate to contact Realtor Kelly Turbeville.